The Department of Youth and Community Development (DYCD) provides free, high-quality youth and family programming to New Yorkers. In addition to the programs on this page, DYCD supports organizations and programs providing a variety of services to families, including parent education programs and services for immigrants. You can find more information about any of these programs, including their locations, by visiting the DYCD website or by calling 311. The 650 OST programs located throughout the city offer a balanced mix of academic support, sports, recreational activities, and cultural experiences for elementary, middle school, and high school youth during after-school hours and on school holidays. Beacons are intergenerational centers offering a wide range of programming for youth and adults including tutoring, college preparation, photography, sports, General Education Diploma (GED) training, English for Speakers of Other Languages (ESOL) programs, parenting skills workshops, and tenant education and advocacy. Beacons programs in 80 community centers located in public schools throughout the city operate in the afternoons and evenings, on weekends, during school holidays and vacation periods, and during the summer. Beacon Satellite Programs at New York City Housing Authority (NYCHA) Community Centers provide services to youth after school, in the evenings, and on weekends. The Beacon model features collaborative community programming that provides quality services to youth and adults after school, in the evenings, and on weekends. The Teen ACTION (Achieving Change Together In Our Neighborhood) program provides youth between the ages of 13 and 21 the opportunity to design and implement a meaningful community service project. The Summer Youth Employment Program (SYEP) is a paid, seven-week summer employment initiative open to young people between the ages of 14 and 21. Assignments include government agencies, hospitals, summer camps, nonprofits, small businesses, law firms, museums, and sports and retail organizations. The application process begins on April 1. Ladders for Leaders offers summer internships to high school students with dynamic corporations and businesses. Participants receive pre-employment training and attend regular workshops. 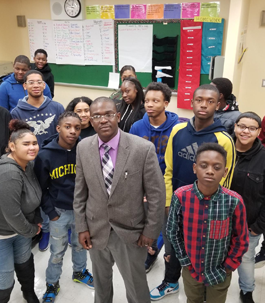 The In-School Youth (ISY) program provides occupational skills, counseling, employment services, and educational opportunities to low-income 14–18-year-olds. All ISY program participants are guaranteed employment in SYEP. The Out-of-School Youth (OSY) program provides extensive job training and employment services to 16–21-year-olds who are not enrolled in school and need assistance upgrading their occupational skills. Drop-In Centers, located in each borough, provide young people and their families services, counseling, and referrals from trained social workers. The Manhattan Drop-In Center also transports youth to and between runaway and homeless youth facilities. Call 311 for more information. These voluntary, short-term residential programs provide emergency shelter and crisis intervention services aimed at reuniting youth with their families or, if family reunification is not possible, arranging appropriate transitional and long-term placements. Call 311 for more information. Transitional Independent Living (TIL) programs provide homeless youth (16–20 years of age) with support and shelter as they work to establish an independent life. The services TIL offers include educational programs, vocational training, job placement assistance, counseling, and basic life skills training. Youth Connect is a confidential, toll-free information and referral service for youth, families, and communities. Operators are available at (800) 246.4646, Monday through Friday, from 9:00 a.m. to 7:00 p.m., and will connect callers to an array of local services and resources. Youthline is available in 152 languages and is accessible to persons who are hearing impaired (TDD) at (800) 246.4699. NYCHA provides a variety of free recreational, cultural, and educational community programs and services, mostly located at NYCHA’s community centers. For additional information on NYCHA programs, please see our student handbook and visit the NYCHA website or call 311. The Parks Department operates 30 recreation centers in all five boroughs of New York City. These centers provide access to facilities such as indoor pools, weight rooms, basketball courts, dance studios, art studios, game rooms, and libraries and offer a range of programs for all ages. Memberships for youth ages 18 and under are free. To locate the nearest recreation center, and for more information about any of the programs, including how to enroll, please see our student handbook and visit the NYC Department of Parks and Recreation website or call 311. New York City has an amazing collection of cultural institutions where the lessons of the classroom come alive on stages and gallery walls, in the living collections of zoos and botanical gardens, and in other richly diverse spaces. Together, you and your children can discover new and exciting parts of culture in our city and in our world by visiting NYC Kids ARTS website. It’s an easy-to-use site that allows you to decide what cultural activities fit your family’s needs. On the site, you can find listings for hundreds of cultural groups and events; many of them are free. Working in cooperation with the Department of Education, this private, non-profit service allows young people and their families to explore these cultural organizations and learn more about the subjects they cover. The website makes it easy to find the perfect activity for your family, letting you search for activities by borough, grade level, discipline, and date. Just log on to navigate the city’s cultural institutions and activities.